Doctors have urged cricket's governing body BCCI to revise its rulebook after a Test match between India and Sri Lanka went ahead in the capital despite players wheezing for air and saying they were vomiting. Delhi Toxic Smog: India-Sri Lanka cricket match was disrupted thrice on Sunday. 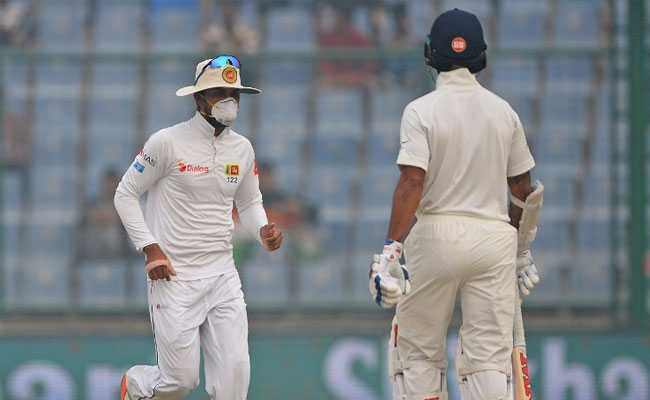 New Delhi: Unprecedented visuals of Sri Lankan cricketers wearing face masks on the cricket field have reignited debate about hosting major sports in heavily polluted New Delhi, where doctors are increasingly vocal about the health risks posed by smog. The cricketers returned on Monday for day three of the third Test even as air pollution at Delhi's Feroz Shah Kotla stadium soared to hit 18 times the World Health Organization's safe level. Play had been disrupted three times on Sunday as Sri Lankan players complained of illness, but umpires ruled the match would proceed. The Indian Medical Association condemned the decision, warning that playing in such conditions puts athletes' health at serious risk. "This match should not have taken place in the first place. It is time the ICC (International Cricket Council) comes up with a policy on pollution," said IMA president K. K Aggarwal. "You have fast bowlers, batsmen and fielders out there exposed to these very harmful pollutants over five days at a stretch. It takes a serious toll on your health in the long run," he said. The Board of Control for Cricket in India, BCCI, declined to comment. It has accused Sri Lanka of making a "big fuss", pointing to Indian skipper Virat Kohli, who hit a record sixth Test double century despite the smog. But the US embassy website on Monday urged Delhi residents to "avoid all outdoor exertion" as concentrations of the smallest and most harmful airborne pollutants known as PM2.5 soared to hazardous levels. These tiny particles -- a fraction the size of human hair -- lodge deep in the lungs and are linked to higher rates of chronic bronchitis, lung cancer and heart disease. The concentration of such particles Monday hit 448 -- compared to a maximum level of 25 considered safe by the World Health Organization over a 24-hour period. Even limited exposure can cause shortness of breath and make the eyes weep and throat burn. Pollution levels generally rise during the winter in Delhi and across northern India fuelled by crop burning in the region and the fact that cooler air traps particulates close to the ground. The smog has become especially alarming in the past two years, casting doubt on the future of sports events. Doctors and public health campaigners have escalated their fight against sports events in Delhi in recent years. Last month more than 30,000 runners competed in the Delhi half-marathon -- just days after smog shut schools amid a public health emergency in the capital. Doctors warned of dire health consequences and challenged the race in court but it went ahead, with runners complaining of burning eyes and sore throats. Greenpeace lobbied in October against India hosting the FIFA Under-17 World Cup, warning it posed unacceptable risks to the world's youngest soccer stars. It also proceeded but schedule was adjusted to avoid Delhi at its worst. "Others should also think about athletes health first," tweeted tournament director Javier Ceppi after images of Sri Lankan cricketers wearing face masks went around the globe. Other events in Delhi like an Asian tour golf title in November and Indian Super League football matches attract less controversy but doctors say pose no less risk. "Ideally, sporting events should not be scheduled in the winter months in Delhi," chest and lung cancer specialist Doctor Arvind Kumar told AFP. "We cannot expose our athletes to inhuman levels of pollution just because a few hundred crores (tens of millions of dollars) is at stake." The Test debacle in Delhi is not the first time cricketers have complained of air pollution in the capital, with Australia citing smoggy air following their loss to India in 1996.